More than 60 science, engineering, and medical librarians from colleges across the country will come to the Great Lakes Science Boot Camp (GLSBC) at the University of Notre Dame’s Hesburgh Libraries to learn from researchers from July 13th to the 15th. The GLSBC is an opportunity for academic and medical librarians to learn about current research developments in the STEM fields so they can provide better support to faculty and graduate students. “The Hesburgh Libraries are proud to host the 2016 Great Lakes Science Boot Camp and to highlight some of the research happening at the University of Notre Dame. As the landscape for scientific research continues to change, it is critical that research libraries from all types of institutions evolve continuously and stay at the forefront of research trends,” said Diane Parr Walker, Edward H. Arnold University Librarian. The pre-camp session presenters are Don Brower, digital library infrastructure lead, and Leslie Morgan, first year studies librarian, from Notre Dame. Attendees will be able to tour several of the Notre Dame Research core facilities including the Materials Characterization Facility and the Molecular Structure Facility. Additionally, librarians from across the great lakes region will offer lightning talks to provide innovative ways attendees can facilitate STEM research at their home institution. Marya Lieberman, one of the event speakers and professor of chemistry and biochemistry, said “Librarians have always offered critical support to the scholarly activities of researchers. The boot camp will illustrate how librarians can meet some of the ‘out of the box’ needs of STEM researchers such as geographic information systems (GIS), database setup and management, patent law searches, and training early career stage researchers. We look forward to welcoming them to campus and providing a researcher’s perspective to their work." 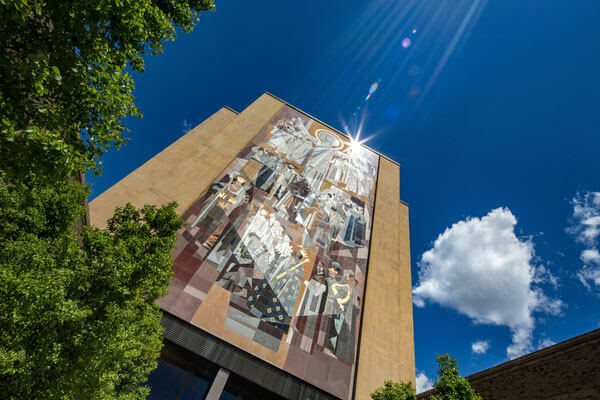 The Hesburgh Libraries is a diverse system featuring the flagship Hesburgh Library, which houses four specialty libraries and centers, and eight branch libraries located throughout the Notre Dame campus. Home to nearly 200 library faculty and staff, the Libraries hold more than 3.5 million monographs and subscribe to more than 35,000 serials. The vast array of expertise, services, resources and spaces help to support the teaching, learning and research at Notre Dame. Digital library services include the Hesburgh Libraries’ Center for Digital Scholarship (CDS). The CDS houses and supports state-of- the art technologies, enabling students and faculty to explore new methodologies, analyze complex data, share research results and work with collaborative multidisciplinary teams. The center’s current research, support, consulting and referral services include: Geographic Information Systems; Data Management Planning; Data Usage and Analysis; Text Mining and Analysis; and Metadata and Digitization Services. 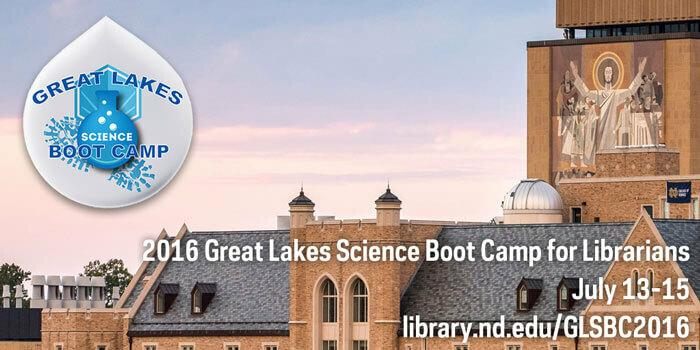 If you would like to learn more about the Great Lakes Science Boot Camp, please visit: library.nd.edu/GLCSBC2016. Originally published by Brandi Klingerman at research.nd.edu on July 12, 2016.